Adian no Tsue (知能ゲームシリーズ（算数－整数編）アディアンの杖, Adian no Tsue? Intelligence Game Series (Integer Arithmetic Volume): Staff of Adian) was the first game in an educational series of video games published by SunSoft in cooperation with Asmik. 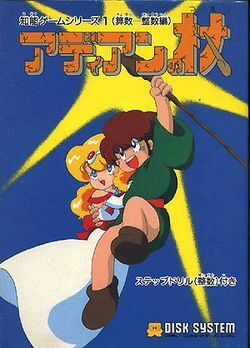 The game was released for the Family Computer Disk System on December 12, 1986 in Japan. In this game, players are quizzed on whole number arithmetic in the guise of a dungeon exploration game directly inspired by The Legend of Zelda. The player moves from room to room, attacking monsters until the time comes to traverse through one of the available doors. At that time, the player may be presented with a math problem which must be solved in order to continue. Unfortunately, the range of the player's weapon is very short, and this often leads to the player getting hurt and losing health while attempting to attack. It is not uncommon to die before too many math problems are solved. This page was last edited on 16 November 2013, at 23:35.